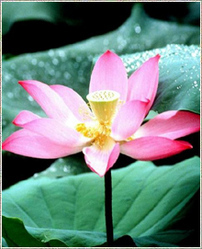 Common Name : Sacred Water Lotus, Sacred Water Lilly, Pink Lotus, Nelumbo Lutea. Part Used : Lotus Flower Petals, Lotus Seeds, Lotus Leaves, Lotus Roots. Habitat : Found in ponds and swamps. Uses : The lotus is one of the world’s most celebrated flowers. From time immemorial to the present day, it has always been in folklore, religion and the arts in one form or the other. Apart from its majestic beauty, the Lotus is held sacred because of the mystical effects it can produce. The ripe seeds produce a wholesome effect in cases of Neurasthenia, spermatorrhea, and metrorthoea. The leaves are the seed cores in decoction are effective of insomnia and haemorrhage. The flowers, seeds, young leaves and rhizomes are edible, while the big leaves, 2 feet in diameter, are used to wrap food in, plant’s rhizomes are a source of lotus meal which is rich in starch. It was often smoked or made into a tea with the idea that it would create a feeling of joy that permeated the mind and body. The stamens (the male reproductive organ of a flower) can be dried and made into a fragrant herbal tea (tea-like drink made of leaves of various herbs). The seeds or nuts are quite versatile, and can be eaten raw or dried and popped like popcorn (small kernels of corn exploded by heat). They can also be boiled down until soft and made into a paste. Combined with sugar, lotus seed paste is a common ingredient in pastries such as mooncakes, daifuku, rice (grains used as food either unpolished or more often polished), flour (fine powdery foodstuff obtained by grinding and sifting the meal of a cereal grain) and pudding (any of various soft sweet desserts thickened usually with flour and baked or boiled or steamed). The rhizomes or leaves are used with other herbs to treat sunstroke, fever, diarrhoea, dysentery, dizziness and vomiting of blood. The whole plant is used as an antidote to mushroom poisoning.